This week the North American International Auto Show is being held at the Cobo Center in Detroit. this weeks Throwback Thursday picture is of the Essex County Automobile Club Rotary Auto Show. 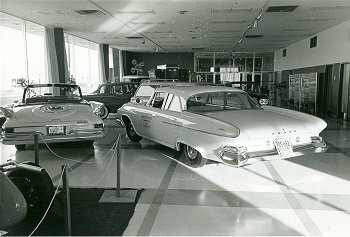 The show was held at the Cleary Auditorium in Windsor, showcasing some fine Chrysler Corporation of Canada automobiles. If you are interested in this our other historic images of Windsor please check out the library’s digital exhibit “Windsor’s, History and Pictures“.